But the first film in the trilogy quickly became one of my favourites. There is something so cinematic and entertaining about the art of the con, seeing someone deserving getting their comeuppance at the hands of someone quick of wit. Films like The Sting, Trading Places, Dirty Rotten Scoundrels will always find their audiences, and even on the small screen, shows like Hustle become mainstays of TV schedules. Then there are variations like Inception and The A-Team, but when you think about it, it’s all about audiences rooting for small-time criminals getting one over on bigger criminals. It’s actually a pretty amoral premise. Thankfully it’s usually pretty enjoyable too. But in one crucial respect, Ocean’s Eleven is a movie of a type we really should see more of. Hollywood these days runs on the comic book adaptations, the sequels, and the remakes. Of the latter, they’ve mostly been remaking successful films to disappointing effect. Ocean’s Eleven was one time when they took a film that was a comparative flop, a Ratpack movie that never troubled the box office, and they remade it better. You get three discs in a BD Amaray case, two either side of a central hinged panel, and one on the rear face. The case also gets an o-card slipcover. I did indeed do it again! My innate desire to double dip my collection, combined with the prospect of a bargain overrode my common sense. 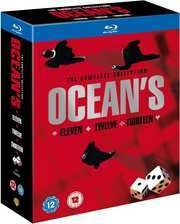 I really only wanted Ocean’s Eleven, but the trilogy only cost a few pennies more than the first film by itself, and the case takes up just as little room. But, lossy soundtracks all around, and while Ocean’s Eleven gets the most disappointing transfer of the three, none of the films really do well by the HD format. Ocean’s Eleven is the one, decent film in the trilogy, Ocean’s Twelve is a dire mess of a film, and Ocean’s Thirteen is watchable (for story, not retina burning visuals), but visibly tired. These are all old discs from the debut of the Blu-ray format. Ocean’s Eleven is really the only one worth owning, and it really does need a complete do-over from a 4k master. Hopefully the release of Ocean’s Eight will convince Warners to give the film the attention it deserves.